Greetings and apologies for the long delay since the last tech tip! I am here to complete a series of posts about how to extract media for academic use. The first installment taught you how to take SCREEN SHOTS of your computer display, while the second guided you through the process of DOWNLOADING CLIPS FROM YOUTUBE. Today, I’ll describe how to rip clips from a DVD using a program called Handbrake, and also say a few words about copyright policy and fair use. Handbrake has been a favorite tool for many because it is free-of-charge, easy-to-use, and works with just about any DVD. However, lately users have been encountering some problems with the program. Either their clips come out scrambled or a pop-up window appears telling them, “Your source may be copy protected, badly mastered or in a format which Handbrake does not support.” I did a few tests myself and definitely came across the first of the two issues mentioned. But do not fret! I’ve done some research (the reason this tech tip is a bit delayed), and there is a very simple workaround. If you’re new to Handbrake, you may have no idea what I’m talking about but this will all make more sense soon. Before going into a step-by-step breakdown of how to use the program, I thought I would preempt some anxieties you might have regarding the legality of using copyrighted material for educational purposes. I think it’s always good to familiarize ourselves with copyright laws as they pertain to an academic context, and so it might be worth briefly revisiting the basic principles of fair use. The Fair Use doctrine is a section of U.S. copyright law that lists various purposes for which the reproduction of a work without an author’s permission may be considered “fair” rather than “infringement.” The University of Minnesota’s library provides a clear and succinct breakdown of four factors that define fair use. The first of these–”purpose and character of use”–classifies the reproduction of existing works for educational purposes as fair. Of course the U.S. Copyright Office is constantly redrawing the boundaries of this category, but it generally recognizes the screening of media clips and compilations in the classroom, as well as student-created media projects, as legitimate educational uses. The question of how educators and students can access this material is another story. The legality of ripping DVDs for educational purposes has been a major point of contention for the courts. When programs like Handbrake and Mac the Ripper were first introduced in the mid-2000s, it changed how educators utilized media in the classroom. They offered a free and easy way to get around a DVD’s copyright code and quickly convert its media files into a friendly format (e.g. MOV, MP4, MKV, etc.). The problem is that they violated the “anti-circumvention” provision of the Digital Millennium Copyright Act (DMCA), which makes it illegal to bypass, decrypt, or reverse engineer technologies designed to prevent the reproduction of content after its sale. This statute initially did not exempt circumvention for fair use purposes. Until a few years ago, this meant that extracting a clip from a DVD for use in the classroom qualified as infringement. Fortunately, in 2010–after long-standing pressure from scholars and academic organizations–the U.S. Copyright Office and Library of Congress issued a provisional three-year exemption for the circumvention of DVD copyright protections if for educational use by college and university professors. You can read the full text of the decision (page 3). They have continued to renew this exemption and in 2012 expanded it to cover K-12 teachers. To put it simply, it remains within your right to rip clips from a DVD for educational use. For now. You just don’t want to upload them to YouTube, Vimeo or any other publicly accessible site. If you’re thoroughly confused, don’t worry. We all are, including the government. Federal copyright law is notoriously vague and constantly being reinterpreted and redefined as institutional technologies change. This is partly why many academic organizations write their own “best practices” statements, which spell out field-specific protocols and justifications for fair use. You can find a list of different best practices statements, and stay updated about developments in fair use law, on American University’s Center for Social Media website. I know this was a lot of info. If you actually read through its entirety, I’m hoping you found it useful or edifying. 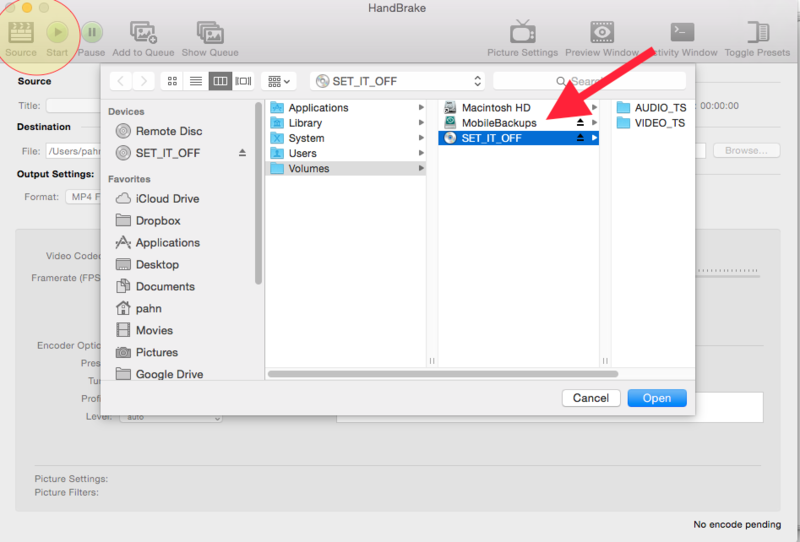 Finally, let’s talk about Handbrake! 1. Download Handbrake: Handbrake is a desktop application, so you’ll need to download it to your computer first. The latest version, 0.10.01, is compatible with Macs using OSX 10.6-10.10 or PCs using Windows Vista up to 8x. Download the correct version for your computer here. The installer package should then appear in your hard drive. Double-click on it to begin the installation process. 2. Download libdvdcss: Some of you who are already familiar with Handbrake may not have had to do this in the past. Handbrake used to perform the dual function of decrypting your DVD’s copyright code and then converting the media files into whatever format you wanted (e.g. Quicktime, MP4, etc.). However, the program no longer supports the decryption process (if you read the text above, you can guess why). This is why clips have been coming out scrambled lately. Before you begin the extraction process, you must first download libdvdcss which is an open-source library that will unscramble your DVD’s copyright code so that Handbrake can access the media files it needs. If you’re on a Mac, make sure to download the second file with “.pkg” attached at the end. The first option is for Unix-based systems. Once again, the installer package should appear on your hard drive. Double-click on it to begin the installation process. 3. Open Handbrake/Insert DVD: Once you’ve installed libdvdcss, you can go ahead and start using Handbrake. Anytime you open Handbrake, the application will automatically prompt you to select your source. Once you insert your DVD, it should show up in your Finder window. Select it and then click “Open.” I’m going to be using one of my favorite films of all time Set It Off (F. Gary Gray, 1999) as an example. If, at any moment, you already have Handbrake open but don’t see a window asking you to select a source, just click on the “Source” button in the top left corner. This means that you need to figure out which chapter(s) contains the clip(s) you want to extract. If your clip is located in chapter 3, then select chapter 3 as both your start and end points. If your clips begins in chapter 3 and ends in chapter 4, then you’ll want to select those chapters as your start and end points. 4. Select Output Settings: The rest of the control panel provides you with some output options. Under “Destination,” you can see a little text field where you can name your clip ahead of time. 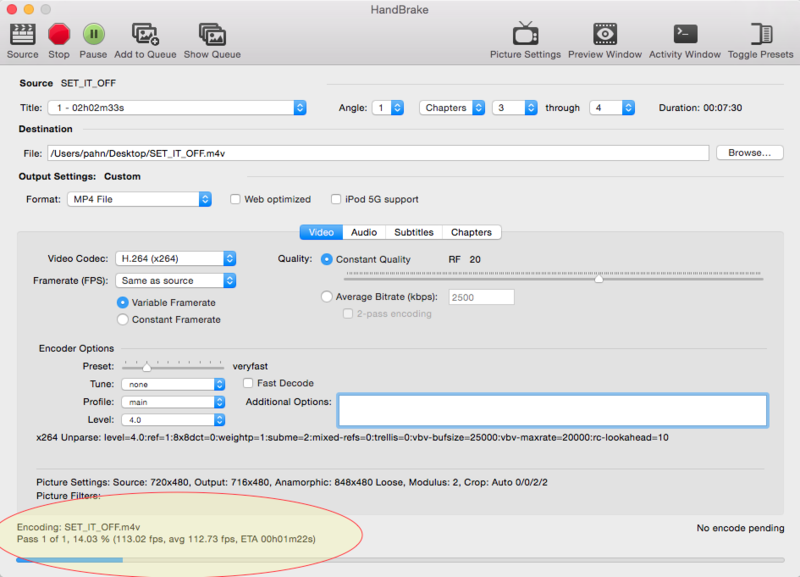 Click “Browse” to select where you want Handbrake to save your extracted clip. Under “Output Settings,” you’ll have two choices: MP4 and MKV. I recommend going with MP4 unless you prefer to play your clip on FLV player. As for your “Video Codec,” you can leave it at H.264 unless you have a specific reason that you want to encode your file differently. 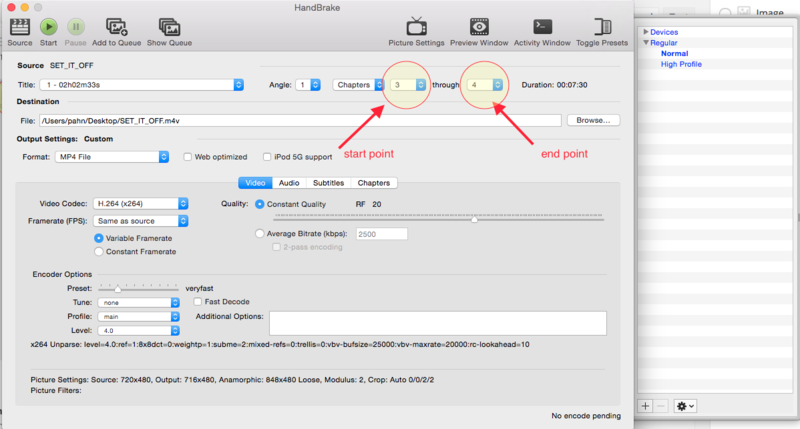 All in all, aside from selecting your start and end points, Handbrake’s default settings should give you what you need. 6. Trim Your Clip: Handbrake will let you know when it’s done. You should be able to find your clip in the destination folder you selected. Most likely, you’re going to want to trim your clip down to the exact portion you want. There are several ways that you can do this. FLV offers a video editing program called Wondershare. If you’re on a Mac, you can use iMovie for which there are many video tutorials available on YouTube. Personally, when I’m just trimming down clips, I use Quicktime Player. Apple’s support site provides a very thorough explanation of how to use Quicktime Player’s features, including its video editing function. And that’s about it. Handbrake is pretty easy-to-use and you’ll rarely run into tech glitches. You can see why Handbrake tends to be a favorite ripping tool. That’s it for this series on extracting media. Hope you found it useful!